In spite of this, we made the decision to go, having heard and read many stories about the beauty of Vieques. We would go, explore, and be careful. We started out before 7 and were having a glorious sail. The wind was scooting us along, the seas were mild, the clouds were fluffy. 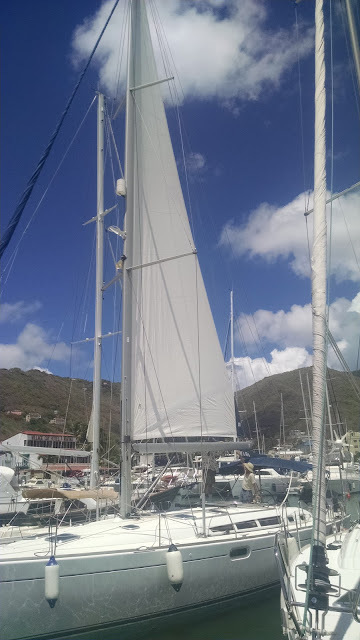 We decided that we should practice reefing the sails. 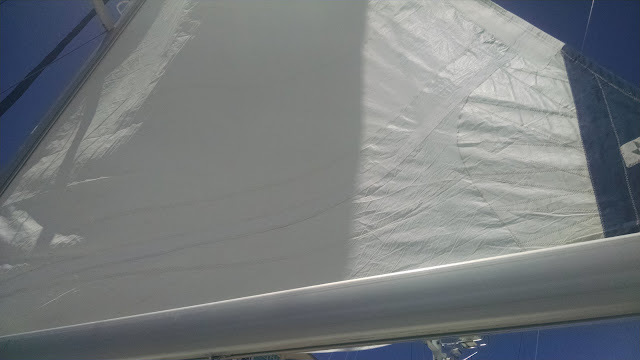 Reefing the sails means making them smaller by rolling them in part way. This is done when the winds are blowing stronger and it helps to keep control of the boat and prevent the wind from overpowering the sails. 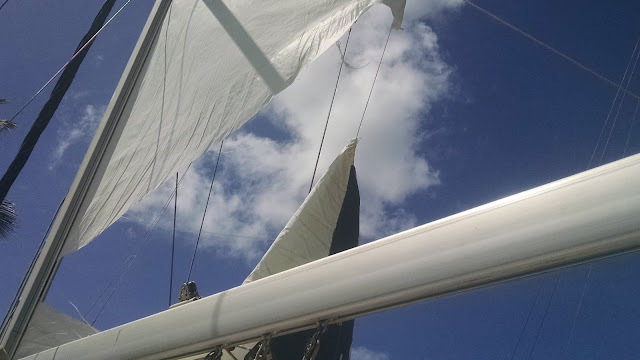 We reefed both sails, the mainsail and the jib, and continued to sail toward Vieques. 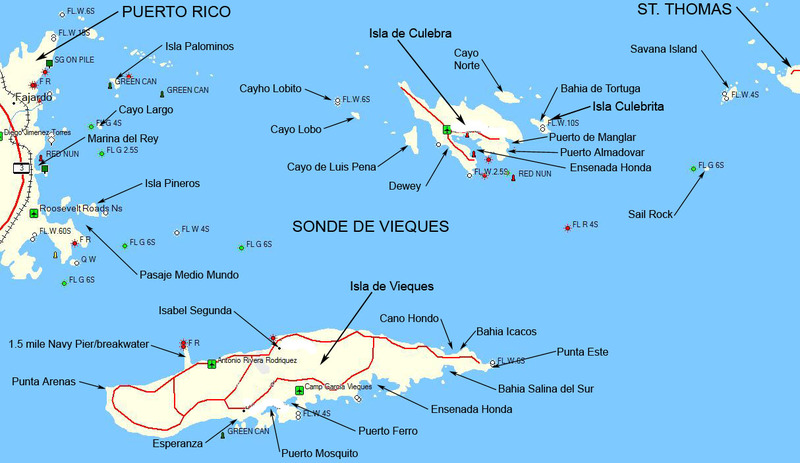 Culebra is north of Vieques. We headed to the south shore. We had almost reached it when Bob looked up and said "the sail has ripped". "Huh?" I said, rather intelligently, and certainly not comprehending. He repeated "the sail has ripped". I still didn't get it. How could our sail have ripped? The wind had started blowing a little harder, but certainly nothing that we should be worried about. But, ripped it had, about 2 feet up from the bottom. I finally comprehended what was going on and we decided that we should head back to Culebra where we had some familiarity, rather than to continue on to a new unknown place. Before we could do that, we had the matter of a flapping, torn sail to deal with. 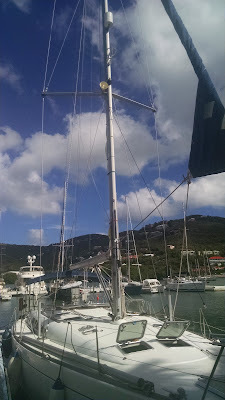 We sailed back north of Vieques so that we could turn downwind to deal with the sail. This would take the pressure off of the sail and allow us to bring in most of it. We managed to bring in most of our sail and turned and motored back to Culebra, feeling somewhat foolish coming back with tattered sails, wondering what we had done to cause the tear. Arriving back in Culebra we hoisted Bob up the mast to bungee the sail to the mast to keep it from flopping around while we figured out what to do next. We made the decision to motor back to the BVI to a sail maker we knew and trusted to get an assessment of the damage. Could it be repaired? Would we have to get a new sail? What had we done wrong? Bob Peterson of Doyle Sails came out to our boat and made the diagnosis. Yes the sail could be repaired, it was a quality sail, and the tear came from years of too many UV rays and the sail not being stowed properly to protect it. Not our fault. Phew! The sail was removed, taken away, and repaired. The following day Bob P returned with the sail, helped us put it back on, and showed us ways to improve the whole system, the boom, the lines, the furling and unfurling of the sail. Now we are whole again. 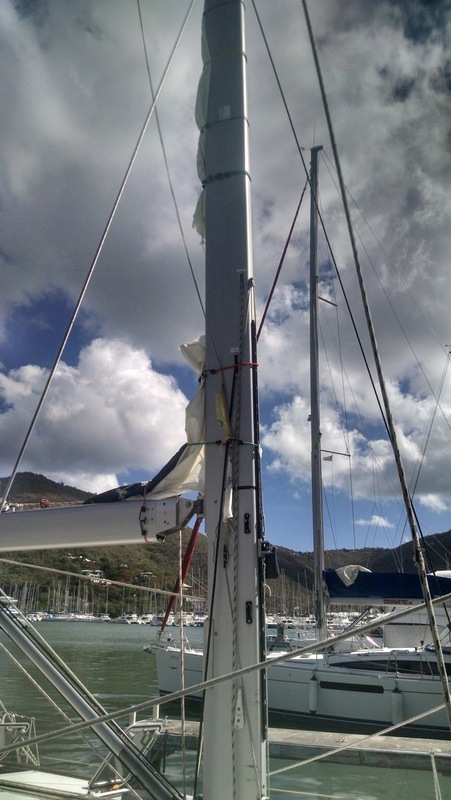 The sail looks prettier than ever, the boom is set correctly and we are ready to go.